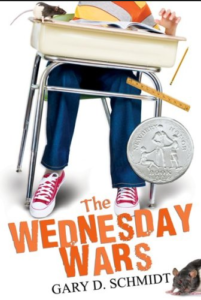 Wednesday Wars is a book that narrates the story of Holling Hoodhood, a seventh grader living on Long Island in 1967. He attends a school in which the students are either Catholic or Jewish and attend their religious education classes every Wednesday. Holling, however, is the only child in his school who isn’t Catholic or Jewish, he is Presbyterian. Every Wednesday, when the other children are away, he is obliged to stay in class, all alone, with Mrs. Baker, his teacher. At the beginning, he is convinced that she ”hates his guts” because she makes him read Shakespeare, even though he actually secretly enjoys it. As the book goes on, they get to know each other and he discovers that her husband is off to the Vietnam war. We also read about his first date and his multiple family issues including his tense relationship with his father and his teenage sister’s escapade with her boyfriend to be a flower child. Through Holling’s life, we are exposed to many historical events of the american life in the 1960s such as the Vietnam war (frequently mentioned) and the assassinations of Robert Kennedy and Martin Luther King. 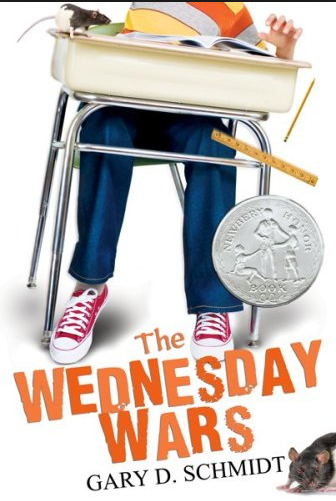 Even though it isn’t the happiest book I’ve read it is definitely entertaining (I often laughed out loud!) and very informative on America in the 1960’s. I really enjoyed reading it! I also found out that it won a few awards!